The Saga of the Insignia of the 31st (Alta.) Recce. Regt. During the Second World War, the 31st (Alta.) Recce. Regt. embarked on what can only be described as an odyssey in their efforts to acquire an officially approved embroidered title. The new unit was organized on March 18, 1942 and drew heavily on volunteers from the 15th Alberta Light Horse and the 19th Alberta Dragoons. Discussions between the two reserve regiments and the Officer Commanding the 31st resulted in a request that the 31st be granted permission to wear the 15th Alberta Horse cap badge, while the 19th Dragoons cap badge would be worn in the manner of cavalry units, on the chevrons or sleeves of the senior NCOs. By established policy, the shoulder title would be based on the authorized unit designation. It appears the rationale behind unit designations and insignia had not been clearly communicated at all senior levels. In February, 1943, Maj.-Gen. J.V. Young , Master General of the Ordnance (MGO), noted that the unit designation did not reflect the parent regiments, and suggested that the designation be changed to the 31st (15th/19th Alberta) Reconnaissance Regiment. This would connect the cap badges to the unit, and this designation would be the basis for shoulder insignia. A sergeant of the 31st (ALTA) RECCE REGT wearing the first pattern shoulder title, the Pacific Command formation sign, with imposed blue over red circle, and the 19th Alberta Dragoons cap badge on his sergeant’s chevrons. Author’s collection. May not be used without permission. The suggested designation was met with less than enthusiasm. The Officer Commanding (CO), 31st Recce indicated: “It is felt that the suggested name “31st (15th/19th Alberta) Reconnaissance Regiment” is too lengthy and cumbersome, and it is desired the present name be retained.”  Both the designations and the desire to associate the unit to the reserve regiments caused consternation in the offices of Director Ordnance Services (Administrative). DOS (A) was concerned that there was no obvious connection between the existing unit designation and the regimental cap and sleeve badges the 31st would wear. And, there was still a possibility one or both of the reserve units could be mobilized, duplicating demand for regimental badges. Lt.-Col. Tosland, Officer Administering the Canadian Armoured Corps, added his opinion, nominating the use of “31st Recce (15/19 ALTA.) 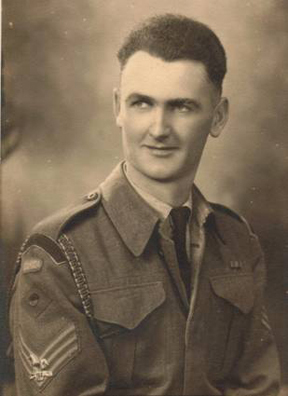 REGT.”, noting his designation was not any longer than “20th Army Tank Regt (16/22nd SASK. HORSE)”. After this recommendation, the MGO stepped back into the discussion, and suggested the unit designation be 31st (15/19 Alta) Recce. Regt. C.A.C. In his opinion this was not unduly long, and it was similar to the designation recently adopted by the 18th Manitoba Armoured Car Regiment. A further variation was suggested, which added “H” and “D”, for Hussars and Dragoons, after the regimental numbers. The OC of the 31st Recce did not respond to any of these proposed designations. The question of the proper unit designation continued to elicit responses from various sources. The Director of Administration, after some research, suggested the designation “31st Reconnaissance Regiment 15/19 Alberta (Dragoons)”. After some discussion about the use of brackets, the new designation made its way through official channels. The Adjutant General’s office waded in with their opinion, suggesting the CO 31st Recce accept the revised designation proposed by the D of Admin. Lt.-Col. Hudson, from DOS (A), noted “as the question of provision of badges is entirely contingent upon the title of the Regiment, it is recommended that action be taken to have the title finally decided upon and authorized first.” His advice had little effect. The CO of the 31st was away on course, and no decision could be made on the revised designation until his return. In the middle of June a cable to NDHQ indicated the CO would not accept DRAGOONS in the designation, and it was suggested that “Alta” be removed. Over six months had passed, and still the question of the designation remained unresolved. 1. Like you I am getting very bored with this argument. It appears that the C.O. of the 31st Recce. Regt. knows very little about army history. A Recce Regt is obviously of a cavalry nature and to put 15/19 without any qualifications seems stupid. 2. The war must go on and we have not got time to teach people very much. Therefore any decision you make will not be objected to by this Directorate. In the interim, the 31st had taken the matter into their own hands, and purchased shoulder titles using regimental funds. Employing the original designation, “31st (ALTA.) RECCE. REGT.”, the titles were embroidered in red lettering on a navy field, sewn on a second layer of gray melton material, creating a gray margin. These were acquired and issued to the personnel of the regiment without official authorization. The first pattern shoulder title, regimentally procured. Note the two piece construction and flat topped “3”. Author’s collection, not to be used without permission. It is considered that the price paid (Approximately 48 cents per pair) is excessive and, as these badges were purchased prior to NDHQ approval being obtained, authority cannot be granted. A General Allowance Claim for $320.00 was granted, which compensated the unit at a rate of 15¢per pair. It was noted that the reimbursement was in line with regular contract prices for titles. It was the middle of November before the cheque was cut. The second pattern title made by Stanley A.Grant Toronto. One piece construction with an embroidered white border. Note the rounded “3”. Author’s collection, not to be used without permission. The saga of the 31st Recce Regiment shoulder title was atypical of procurements. Most shoulder title authorizations moved through the system in a timely fashion. The attempt to please all parties with an acceptable designation had only led to confusion, frustration and long delays. As predicted, the regiment was not perpetuated in the post war army re-organization, and the 31st (ALTA.) RECCE. REGT. disappeared into the annals of history. Their shoulder titles remain as the only artefact to mark their contribution to Canada’s war effort: no Alberta Tommy Gun Fusiliers were raised to perpetuate the unit. Potts A.E. Maj.Gen. GOC 6th Canadian Division, Letter, Regimental Dress, 31 (Alta) Recce Regt C.A.C., December 5, 1942. Young J.V. Maj.-Gen. MGO Reply to GOC 6th Canadian Division, January 8, 1943. LAC RG 24 Vol. 2266, File HQ 54-28-1299-2. The use of the 15th ALH cap badge was based on seniority of the two units involved. Within months the use of the 19th Alberta Dragoons badges was forgotten. The 15th ALH and the 19th Alberta Dragoons only had slip-on titles authorized during the war. The 19th Alberta Dragoons coloured embroidered title was not authorized until post war. Presont J.F. Brig. Fortress Commander, Esquimalt Fortress, Letter Regimental Insignia Dress Regulations 31st (Alta) Recce Regt C.A.C., CA. March 12, 1943. The 31st was under command of the Fortress Commander at this time. Tosland A.L. Lt.-Col. OA CAC, Memorandum, Dress 31st (Alta. )Recce Regt. C.A.C., to DOS (A), March 27, 1943. LAC RG 24 Vol 2266. Unidentified Lt.-Col., for the MGO, Letter, Regimental Dress, 31st (Alta) Recce. Regt. C.A.C., March 30, 1943. The variations for the designation were all upper case. The post numeric D and H were to represent Dragoons and Hussars. It is unclear where the Hussar affiliation came from. It was argued that Dragoons should be an acceptable designation, as the D of Admin believed the 15th ALH had at one time a Dragoon regiment in their lineage. Unidentified Colonel, D. of Admin, Memorandum Regimental Dress, 31st (Alta) Recce. Regt., to D. Org., June 18,1943. LAC RG 24 Vol 2266. Saunders R.P. Col. DOS (A), Memorandum to Dir. of Org., June 22, 1943. LAC RG 24 Vol 2266. Young J.V. Maj.-Gen. MGO, Letter to GOC in C Pacific Command, September 25, 1943. LAC RG 24 Vol. 2266. Various memoranda and letters, 31st (Alta) Recce Regt. LAC RG 24 Vol. 2266. The Inspection Board of the United Kingdom and Canada was a wartime agency that monitored the contracts and quality of goods and materials ordered by the governments of the two nations.